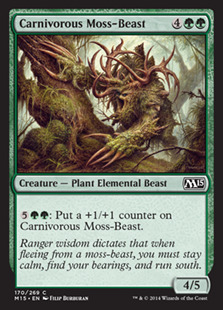 Card Text: : Put a +1/+1 counter on Carnivorous Moss-Beast. Flavor Text: Ranger wisdom dictates that when fleeing from a moss-beast, you must stay calm, find your bearings, and run south. We do not currently have any combos that utilize Carnivorous Moss-Beast. If you have your own Carnivorous Moss-Beast combo, we would greatly appreciate it if you would consider Adding Your Combo to our site. 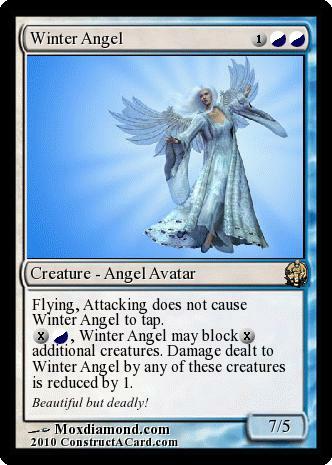 We do not currently have any decks that use Carnivorous Moss-Beast. If you have your own deck that has Carnivorous Moss-Beast in it, we would greatly appreciate it if you would consider Adding Your Deck to our site. Carnivorous Moss-Beast was originally printed, and so far only exists in the Magic 2015 magic the gathering set.